Arriving home late from a family Chanukah meal, I was still craving some savory food. Because let’s face it, Chanukah parties are all about the sweets! So I headed over to the fridge and found myself a nice bowl of leftover soup to heat up and enjoy! That’s what leftovers are for, after all. Enjoying my butternut squash chestnut soup with roasted chestnut, fresh thyme and candied pastrami topping. Wrap the sweet potato and butternut squash in aluminum foil and bake for an hour or until can easily be pierced with a fork. In a stock pot, heat up the olive oil over medium flame. Add in the leeks and sauté until golden. Add in the sage, thyme and garlic and sauté for 2-3 minutes. Add in the bourbon and cook for a few minutes. Add in the roasted and now soft sweet potato and butternut squash (remove the skins and seeds after they were roasted). Add in 1 bag of chestnuts and give everything a good mix and add in the stock/water. Bring to a boil and lower to a simmer for 20 minutes. Remove from the flame and blend the soup using an immersion blender. Add in the honey, salt and freshly cracked pepper. 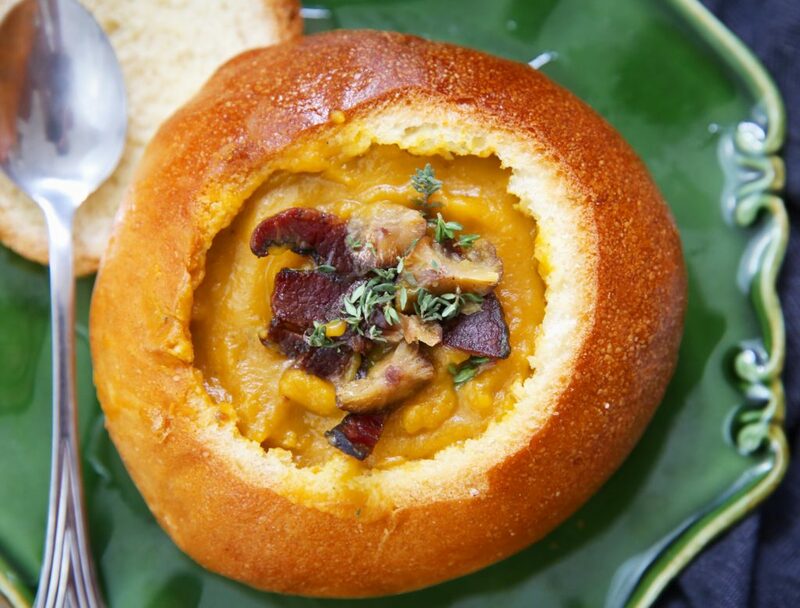 Adapted and combined from Kosher by Design Brings it Home (sweet potato chestnut soup) by Susie Fishbein and The Silver Platter (sweet potato & squash soup) by Danielle Silver. *Candied Pastrami: Slice a package of pastrami thinly. Sauté in maple syrup until golden and crispy.